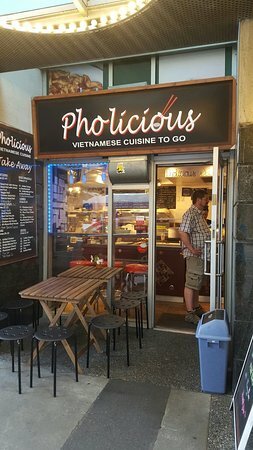 The food at this place is just great Vietnamese. The chicken sandwiches are great and fresh and tasty. Just love the attention to fresh. This hole in the wall restaurant really does Pho right. Everything I have eaten at this almost food truck not on wheels is very good. Service is efficient and good at the counter. Big thumbs up. Just a great little hole in the wall [literally] with all the positive values of quality, service and value. Quick service for non-fast food. Great staff, excellent price and food. 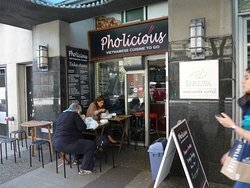 A gem of a restaurant with the best value in city centre Vancouver. A group of friendly ladies run this minuscule sized place mostly designed for take out. Maybe 6-8 seats available between counter inside and table outside. Every dish made fresh, and each soup put together with care as ordered. 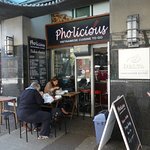 Get quick answers from Pholicious Restaurant staff and past visitors.